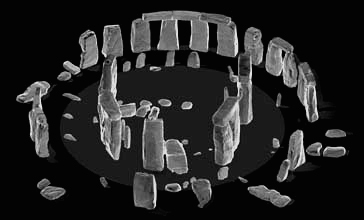 Foamed polystyrene, often known by one of its brand names, Styrofoam, makes an attractive material for Stonehenge replicas. It is light and can be formed into any shape. Lintels no doubt help to keep the light uprights in place. We know of two Foamhenges. One is in Virginia in the States (to be covered later), and one was a temporary construction, built on the Wiltshire Downs by Channel 5 TV in the U.K., and then sold on Ebay. This was a full-sized careful reconstruction of the monument at its height, rather better-looking than many because the real shapes and irregularities of the stones were taken into account. Is the odd pink cast meant to be the colour of the megaliths when they were first cut? We welcome any information that would shed light on the mystery of the flesh-coloured stones! Many thanks to brilliant photographer Pete Glastonbury for permission to use his pictures. Permission to use them elsewhere must be given by him. Our original score for this henge replica was a solid (well, as solid as they can be, made of carpet tubes and polystyrene) 8 druids, but recent conversation has caused us to reconsider and this entry’s score has been increased to 9, with 9½ a future possibility. Very nice! Just found this: a Youtube video [link] showing the research done at this Foamhenge. Brilliant! 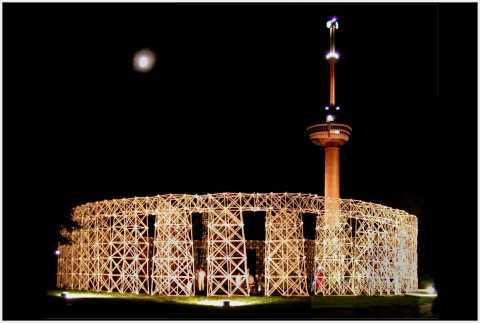 Stonehenge has always represented midwinter to us, and this bears that intuition out. To learn what manner of biscuit took the title by “embracing contemporary values and looking positively to the future, whilst upholding the majestic greatlitude and history befitting the henge tradition” take a look at the site. 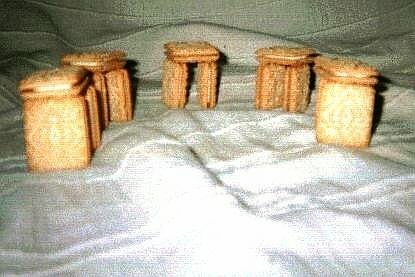 Four kinds of biscuits compete, each with its own henge picture, and with an unexpected victor. This had everything we look for in a henge page except, well, adequate photography. Score: 8½ druids for the web page, awarded for keeping the right attitude in the henge wars! Along with the Doorhenge video, this makes the idea of cooperative building of large henge replicas look very appealing. What it lacks in likeness to the original Stonehenge it makes up by bringing in the group dynamic that must have been involved in the building of the original, in a way we have seen with no other replica. Score: 8 druids! 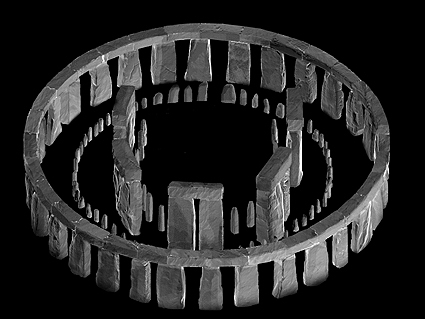 Rare item: a henge replica at Stonehenge! 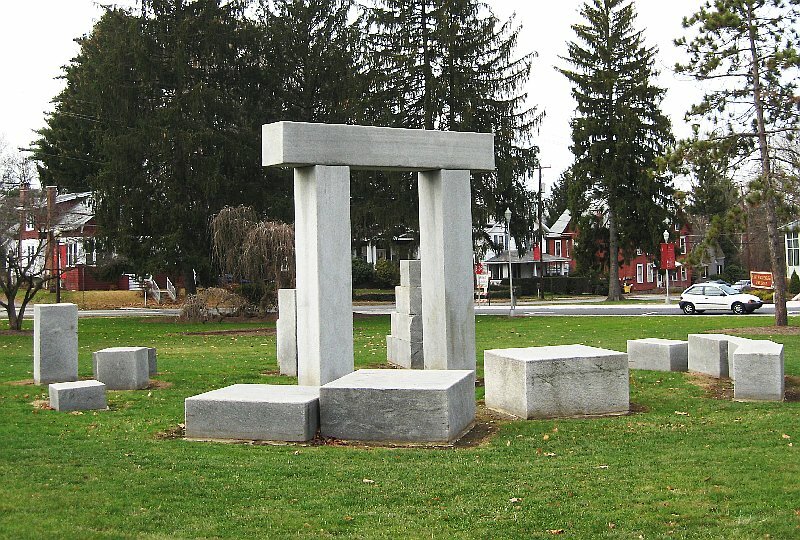 This lucky person, Leon Reed, saw this 12 years ago and fortunately for us saw the meta-henge possibilities. 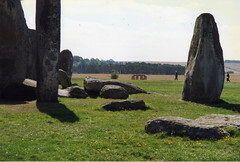 We have found no other pictures so far in which a henge replica stands close enough to Stonehenge to appear in the same picture. Thank you, Mr. Reed! Have to give this one a good bunch of druids, for the situation and a game attempt at reproducing the current state of the monument. 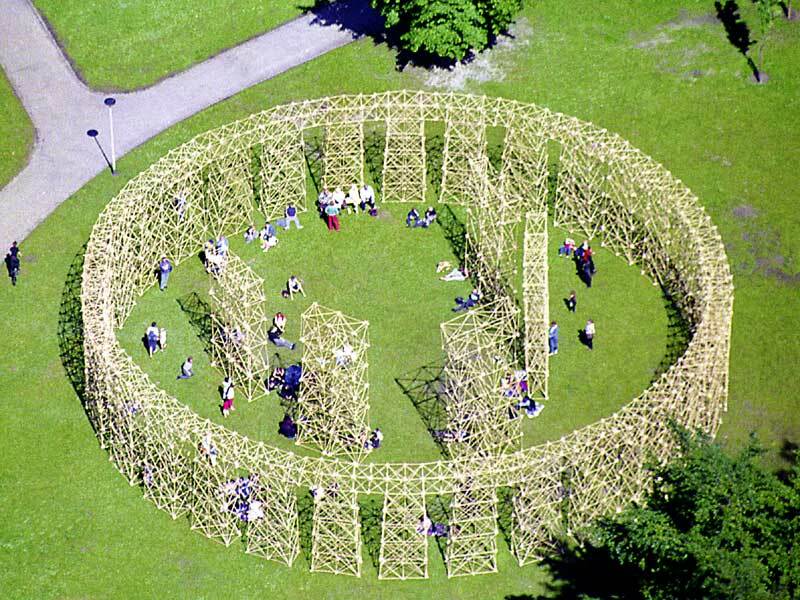 7½ druids for this straw henge, partly for the haiku-like visual juxtaposition of megalithic timelessness and the fleeting seasons of the field. 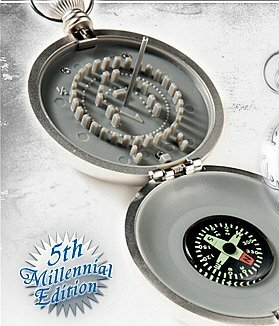 Yes, you get a tiny henge monument and a compass to help you use it to figure the time. “Every astronomical function that was intended by the original builders of Stonehenge can be accomplished with the watch.” Or so the makers claim. In case you’re not good at telling time with shadows, the outside of the watch has an analog watch face marked with Roman numerals. There’s no denying this is a nifty thing. But how many druids does it score? Feeling generous after a big meal and an afternoon with family, we will award it 8 mini-druids. And it will fit in a stocking hung on your mantlepiece! *megarak: portmanteau word formed from megalith and anorak, meaning one who is very interested in (possibly even obsessed by) megaliths, standing stones, stone circles, etc.